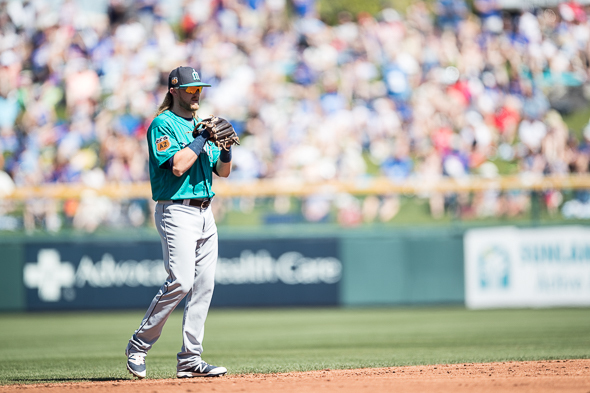 The Mariners decided to keep one reserve outfielder, Guillermo Heredia, and one reserve infielder, Taylor Motter, as they cut the roster to 25 ahead of Monday’s opener. Five pitchers are on the DL. The Mariners reached their 25-man roster Friday by anointing Guillermo Heredia over Ben Gamel as the fourth outfielder and deciding to keep eight relievers, including lefties Dillon Overton and James Pazos. Also new to the pen this year are RHP Casey Fien and LHP Mark Rzepcyznski. General manager Jerry Dipoto and manager Scott Servais decided to put six players on the 10-day disabled list, including four right-handed pitchers: Steve Cishek (hip surgery recovery), Shae Simmons (elbow strain), Rob Whalen (shoulder inflammation) and Tony Zych (shoulder biceps surgery recovery). Also on the list are INF Shawn O’Malley (appendix removal) and LHP Drew Smyly, the No. 4 starter who was diagnosed Friday with a flexor bundle elbow injury and is likely to be out six to eight weeks. His spot was taken by Ariel Miranda, who had been sent to AAA Tacoma after a poor spring. Beyond the Smyly injury, which was a blow, none of the maneuvers was a surprise, at least since 1B Dan Vogelbach was sent down to Tacoma last week. He was scheduled to platoon with Danny Valencia at first base. Gamel and C Tuffy Gosewisch were assigned to the Rainiers. Sent to the minor league camp were RHP Jonathan Aro, LHP Dean Kiekhefer, INFs Mike Freeman and Tyler Smith and C Nevin Ashley. Other newcomers to the Seattle major league roster are starting RHP Yovani Gallardo, backup C Carlos Ruiz, SS Jean Segura, Valencia, starting OFs Jarrod Dyson and Mitch Haniger and INF/OF Taylor Motter. Motter, 28, who had 80 at-bats in 33 games last season in Tampa, was the key figure in shaping the roster. His ability to play each infield spot and help in the outfield corners allowed the Mariners to carry one position bench player besides catcher, which made room to carry an eighth reliever. Given the potential early return to health of several relievers, the pen will be in flux for awhile behind Edwin Diaz as closer and Dan Altavilla as eighth-inning set-up man. Also, Overton won’t be available for the first three games as his wife is due to deliver a baby. The Mariners open their 40th anniversary season at 5:10 p.m. PT Monday in Houston, the first of seven road games before the home opener at 2:10 p.m. April 10 against the Astros.